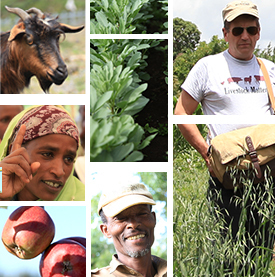 In 2012, Africa RISING funded an ‘early win’ project in Morogoro, Tanzania led by the World Vegetable Center – AVRDC. The projects aim to be more productive/intensified and sustainable rice-vegetable production systems along with improved access for smallholder farmers to markets, leading to diversified and increased household income from vegetables and enhanced nutritional security from safer vegetables, of particular importance to pregnant women and young children. Baseline data on production and market constraints of vegetables as intercrop with rice or as sole cropping system and food safety analysis with vegetable supply chain actors. Characterization of rice-vegetable based production sites and consumption patterns of representative rural and urban households in the target region. On farm assessment of the incidence of pests and diseases for tomato and African eggplant. Analysis of microbial, pesticide and heavy metal contamination of market and farm samples of tomato and African eggplant. Tags: africa rising, early win, USAID. Bookmark the permalink.